Ever thought of doing a recharge but still having money in your wallet? Or paying your bills on time because you get 60% cashback on your payments? You can find this and more such promo codes only on Freecharge. Freecharge is an easy way to recharge and pay off your bills with just one click. This online bill payment and recharge store gives guarantee to give you the best rebates so that you don't feel the weight of month-end crisis. Now you can pay your bills anytime irrespective of the time of the month because Freecharge gives 100% cashback promo codes as well. Try out this site today only with Happy Sale. Hurry up and make your payments today! Verified on 23/4/2019 . Freecharge electricity bill payment coupon code is here. This is valid for all users and no minimum bill payment is required. Use will get maximum cashback of Rs 50. Applicable on only once per user/credit/debit card/mobile number. For more details check the terms and conditions. Use promo code to avail the cashback. Hurry! Pay your bill now. Verified on 23/4/2019 . All Freecharge users can pay their electricity bill using Freecharge wallet and get flat Rs 50 cashback using this promo code. Minimum bill value must be Rs 750 to use this discount code. Pay now. With Freecharge, get Rs 50 cashback on postpaid bill payments. Use this promo code to get maximum cashback of Rs 50. Minimum bill value must be Rs 20. Valid once per user. Offer is not Valid for Add Cash, Prepaid, Datacard, Landline, Electricity, Gas, DTH, Broadband & Metro transactions. Not Valid for Add Cash Transactions and Airtel transactions. Pay today. Verified on 23/4/2019 . pay your electricity bills via Freecharge and get flat 30 cashback by using this given promo code. Offer is valid only for Electricity bill payments & for all users. Minimum Bill payment of Rs 200 is required. Pay now. Freecharge is giving 100% cashback on first recharges or bill payments by applying this Freecharge promo code. Maximum cashback Is Rs 75 no minimum transaction amount required. This promo code is applicable on credit/debit card /net banking transactions only. Not valid for adding cash and transactions done via Freecharge balance. Valid only Once per New User/Credit/Debit Card/Mobile Number. Valid on credit/debit card transactions only. Cashback will be credited to your Freecharge Wallet which can be redeemed within 185 days from date of credit and is non transferable. Recharge it today. Hurry ! Verified on 23/4/2019 . Freecharge wallet in co-ordination with Swiggy have come up with an exciting offer! Order your favorite food online and make your payments through wallet and get flat flat 25% up to Rs 50 cashback on all your transactions. Valid twice per user. Cashback will be auto credited to your wallet within 24 hours. Place your order today! Verified on 23/4/2019 . Freecharge is offering 20% cashback up to Rs 75 on deposit made on RummyCircle with FreeCharge Wallet. The Offer is valid for the first deposit made by players on RummyCircle through online payment options only. Add now. Verified on 23/4/2019 . Freecharge is now offering 5% cashback on DTH recharge, electricity bills, GAS, landline, metro & postpaid bill payments by using the given coupon code. No minimum transaction is required. Maximum cashback of Rs 25. Valid for both old and new users. Terms and conditions apply. Recharge now. Get flat 22% discount and additional Rs 50 cashback on prescription based medicines using Freecharge wallet payment mode at 1MG online portal. There is no limit on the maximum discount on prescription medicines and allopathic medicines. No minimum order value required. Pay now. Freecharge is giving up to Rs 25 cashback on electricity bill payment. Use this promo code to get maximum Rs 25 cashback and valid on a minimum bill amount of Rs 10. Valid only once per month. Pay now. Verified on 23/4/2019 . Freecharge landline bill payments offer: Get up to 100% cashback on your bill payment. Choose from airtel landline, bsnl, reliance, mtnl & more. Check more details in the landing page. Pay now. Verified on 23/4/2019 . Freecharge is offering 100% cashback on all recharges or bill payments. Valid on minimum transaction amount Rs 10. 1 lucky user will win 100% cashback every minute on any one. Grab now. Verified on 23/4/2019 . Get flat Rs 10 cashback successful Recharge/Bill payments. Use this promo code to get Rs 10 cashback. Valid only once per new user and valid on debit card transactions only. Valid on Minimum transaction of Rs.10. Use given promo code to avail this cashback offer. Verified on 23/4/2019 . Freecharge is offering 20% cashback at McDonald's when transactions are done using FreeCharge wallet. Transact at McDonald's outlets in Gujarat, Madhya Pradesh (Indore only), Andhra Pradesh, Karnataka, Tamil Nadu, Maharashtra & Kerala using Freecharge Wallet & get 25% cashback, maximum Rs.50. Enjoy maximum of Rs 50 and one time per user. You can receive the cashback within 24 hours. Offer valid on all orders at McDonolds paid via Freecharge. Verified on 23/4/2019 . Freecharge Jio recharge offer brings flat 100% cashback up to Rs 75 on mobile recharge. Use this coupon code while doing your transaction to get this cashback. Valid for Jio new users. Get it now. Verified on 23/4/2019 . Freecharge is giving 10% cashback on postpaid mobile bill payments, prepaid, DTH, & data card recharges. Valid only for transactions done through Snapdeal HDFC credit cards only. Maximum cashback that can be availed is Rs 50 per transaction using this coupon code. This cashback will be credited as FreeCharge cash within 24 hours. This is valid for 3 times per Snapdeal HDFC bank credit card holder/user. Valid on all recharge platforms like mobile app, website, mobile site. This coupon code is valid for both new and old users. Recharge now. Recharge your Jio number using your Freecharge wallet and get up to Rs 30 cashback. No minimum transaction of amount required. Valid for old jio users. Get it now. Verified on 23/4/2019 . Freecharge wallet Dominos coupon is here. Order at Domino's and make payment using Freecharge wallet to get flat 25% cashback up to Rs 50. Offer applicable only on the Domino's Pizza Website/App. Cashback offer valid once per user Order now. Verified on 23/4/2019 . Order your groceries online at Bigbasket and make payment using Freecharge wallet by using this promo code to get flat Rs 50 cashback. Minimum order value should be Rs 800 and valid twice per user. Cashback will be credited to Bigbasket wallet within 24 hours of order delivery. Valid for all users. Order now. Verified on 23/4/2019 . 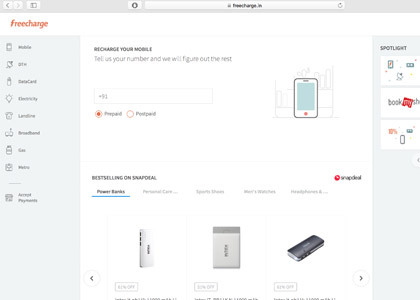 Freecharge is offering fast checkout on Heritage bill payments. Pay using the Freecharge wallet to avail more cashback offers. Shop at any near Heritage supermarket and Pay to earn cashback using this offer. No Freecharge cashback code required to get this grocery offer. Buy now. Verified on 23/4/2019 . Now recharge your Aircel prepaid number with Freecharge and get a free burger from McDonalds, a gift hamper from The Body Shop, a Krusher from KFC or even a free movie ticket. While doing your Aircel recharge you can pick these deals for free. Just recharge and enjoy exclusive deals on entertainment and Food. No offer code required. Valid for all users. Recharge now. Verified on 23/4/2019 . Online prepaid recharge, bill payments, online shopping is made easy and quick with Freecharge wallet. Surf through the freecharge online recharge offers and cashback offers. Save on prepaid mobile recharges, postpaid bill payments, electricity bill payments, DTH recharges, metro smart card recharges, utility bill payments with Freecharge. The wallet is launched in partnership with Yes bank. Now recharge with online recharge offers and get huge savings. Verified on 23/4/2019 . Make your bill payments with Freecharge wallet and get up to Rs 200 off. Offer applicable on all postpaid and prepaid bill payments. No discount codes are required to get this offer. Valid for all users. Hurry up and pay your bills now! Verified on 23/4/2019 . Refer your friends to Freecharge by sharing your unique code, get Rs 50 cashback for you and your friend. Maximum you can earn by referring friends is Rs 5000 only. Enjoy cashback of Rs 50 within 24 hours. Refer now. Hurry! Verified on 23/4/2019 . Get 10% cashback when you pay with Freecharge on Redbus. A user will get maximum cashback is Rs 75. Offer applicable on the redBus Website & App and this offer is valid once per user. No coupon code required. Verified on 23/4/2019 . get 25% cashback on buying Google play credits with FreeCharge. Valid on minimum transaction of Rs 100 and maximum cashback of Rs 75. Apply the given coupon code at checkout page and avail cashback. Valid once per user. Hurry! Grab now. Verified on 23/4/2019 . Get 5% cashback up to Rs 50 each on your next 3 postpaid bill payments done with FreeCharge. Offer is valid only for Mobile postpaid bill payments and for all users. Valid once per month. Use this postpaid bill payment coupon code and get cashback. Order Pharmeasy online and make payments through FreeCharge wallet and get 10% cashback up to Rs 75. Valid once per user and also get extra 10% off on your first order. Verified on 23/4/2019 . Order at Faasos and make payment using Freecharge wallet to get flat 25% cashback. Offer valid on minimum order of Rs 299. Use this Freecharge discount code to get maximum cashback of Rs 50. Cashback offer valid once per user. Order now. Verified on 23/4/2019 . Send money via FreeCharge UPI and get 100% cashback into your FreeCharge wallet. No minimum transfer amount required and maximum cashback of Rs 25. Offer is valid on 1st ever FreeCharge UPI transaction only. Applicable on once per user or account.? Get flat 10% up to Rs 50 cashback when you pay with Freecharge on PayU. Offer is valid twice per user and not valid on Domino's Pizza and SonyLIV. Cashback will be credited to Freecharge wallet within 24 hours. Verified on 23/4/2019 . Get 10% cashback on deposit made on Adda52 with FreeCharge Wallet. Maximum cashback of Rs 50, valid once per user. No coupon code required to get this cashback offer. Valid for all users. Get it now. Verified on 23/4/2019 . Get 10% cashback up to Rs 50 when you pay with FreeCharge on RailYatri ticket booking online. Offer is valid once user during the offer period. Hurry! Book your train tickets, bus tickets and hotels booking and get cashback. No Freecharge Railyatri offer code required to avail this offer. Freecharge wallet offer for Jet Airways customers is here. Book flight tickets at Jet Airways and pay using Freecharge wallet to get flat Rs 100 cashback. Offer valid on minimum transaction value above Rs 3500. Book now. Verified on 23/4/2019 . Get 10% cashback up to Rs 10 on transaction on successful recharge or bill payments. Valid on minimum transaction of Rs 10. Maximum cashback of Rs 10. Valid 3 times per user. Use promo code to avail cashback offer. Verified on 23/4/2019 . Get 50% cashback on recharges/bills when you pay with Freecharge UPI. Maximum cashback Rs 25 and valid twice per user. Applicable on minimum transaction of Rs 10. Valid for all users. Get it now. Verified on 23/4/2019 . Make recharge or bill payments through Freecharge and get Rs 1000 MakeMyTrip wallet cash. Valid on minimum recharge/bill payment of Rs 50 and valid once per user. MMT unique code will be sent to the user via SMS or email for successful transaction within 24 hours. Hurry! Get it now. Verified on 23/4/2019 . Get 25% cashback up to Rs 50 when you pay with Freecharge on TicketNew. Offer valid once per user and applicable on the TicketNew website & Android app. Hurry! What are you waiting for? Book your movie tickets & make payments through FreeCharge and get cashback. Verified on 23/4/2019 . Get flat Rs 50 cashback when you pay with Freecharge wallet on Zivame. Valid on minimum transaction amount of Rs 499 and above. Valid once per user. Shop now. Verified on 23/4/2019 . Get 15% cashback, up to Rs 75 when you pay with Freecharge on Shopclues online shopping. Offer applicable on the Shopclues website & mobile app. No coupon code required to get this offer. Shop now and avail cashback. Verified on 23/4/2019 . Pay with Freecharge wallet on Tapzo and get 5% cashback up to Rs 25. Offer is valid once per user and applicable on the Tapzo Android App only. With Freecharge, recharge is done in Simplest & Fastest way. Get 10% Cashback on a minimum transaction of Rs 50 and above at Freecharge. Use this coupon to avail 10% cashback. Coupon valid for all users. This Coupon is valid for Pre Paid Mobile, Postpaid Mobile Bill Payment, DTH, Data Cards, Utility Bill Payments & Metro Card Recharges. User need to use Visa Debit/Credit card to use this coupon, not valid for add cash transactions, Net banking transactions, payment via freecharge balance as payment option. Not valid on Airtel prepaid/postpaid/DTH. Do online free recharge with Freecharge. It provides Rs 50 cashback on recharge and bill payments of Rs 50 or above. This free mobile recharge coupon is valid for new users only. Not valid for Airtel users. Code can be valid only one time per new user/credit /debit card/mobile number. Not valid for add cash transactions and transactions done via Freecharge balance. This is valid on Freecharge app, web & mweb. Freecharge brings flat Rs 10 cashback on minimum mobile or DTH recharge of Rs 100 by using the above promo code. Maximum cashback is Rs 10. This is Valid on successful mobile recharges or DTH recharges. This code is valid for all users. This is valid only once per user/credit/debit card/mobile number. This is valid on credit/debit card and FreeCharge balance transactions. This is Not valid for add cash transactions and transactions done via net banking. This is valid on App only. Get 15% cashback on postpaid bill payment for users doing first transaction for postpaid only at Freecharge. This coupon is valid on minimum transaction of Rs 400. Get maximum cashback of Rs 100 per transaction. This discount coupon code is valid only once per user/credit/debit card/mobile number. This is not valid for add cash, net banking & Airtel postpaid/prepaid/DTH/landline transactions. Freecharge brings 30% Cashback on 3G Recharge of Rs 100 by Using the above coupon. This is Valid on 3G Recharges of Rs 100 or more. Get Flat Cashback of Rs 30. This is Valid only Once per User/Credit/Debit Card/Mobile Number. This is Valid on credit/debit card & Net banking transactions only. This is Not Valid for Add Cash Transactions and transactions done via FreeCharge Balance. This will not work for Airtel transactions. This is Valid only Once on app and for New users. There are a number of Tata Indicom plans and packages that are available on Freecharge. These packages range from base plans, prepaid packs, talktime packs, top-ups, STD packs and more. Users can check for plans by clicking on a link from the prepaid Tata Indicom page. You can recharge on website, mobile site, and mobile app (Android, iOS, and Windows) without using any Freecharge offer code. Recharge today. One of the expanding and prominent brands in India, Freecharge came into function 2010, August. Simply put, as the name of the brand suggests it deals with online recharges and paying bills, but with a difference. The brand offers its customers with the online facility to recharge any of their prepaid mobile connections in India. The amount that the user pays for recharging is finally returned in the form of shopping discount coupons of any popular retailer brand in India, which in a way makes recharging completely free. This is what has been making the brand popular amidst a huge spectrum of customers in India. The initial retailers that got associated with the brand were Barista and McDonalds. And very soon this was followed by other popular names such as Cafe Coffee Day, Jet Airways, Domino’s Pizza, Shoppers Stop, Croma, Puma and many more. Over the years the user base or customer base of this brand has increased to a great extent. And today, Freecharge other than providing exciting services to its existing and potential customers is also interested in expanding its customer base in whichever way possible. One of the best ways of wooing in new customers is offering discounts and offers. And if you have been wondering where you can have access to some of the best deals then you can simply browse through HappySale and have access to the Freecharge coupons and make the most of it. Today, the online technologies are making life and attending to the daily chores extremely easy! Did you ever think of having a recharge done to your account, when you still have money with you? Or perhaps go ahead and pay your bills right on time, because you might enjoy a 60% cashback offer on your payments? If not and you wish to enjoy this and many more, then you can have access to the best of the offers that are available on Freecharge and add to your savings! This brand has gained immense popularity today. And if you want to make the most of the same then you simply need to search by keying in the phrase Freecharge coupons and you will find the best deals online. If you want to browse from one website, then the best to opt in for is HappySale as here there are several deals and offers listed for you to browse and select from. If you are one who delves into online shopping and deals, then chances are you will be keen on the Freecharge coupon codes. However, if you are a new user and have been mulling on the question and on the fence, not being able to decide on the discounts and offers provided by the brand, give this situation a thought – wouldn’t you like to get your prepaid account recharged and get a coffee and food combo offer from Cafe Coffee Day or Barista? And it doesn’t stop at that. You will have the chance to select from several deals and offers. For instance, you will have access to offers like 100% cashback on your recharge as well as 5% cashback on your bill payments. If you are a new user you will have special offers on your first bill payment or mobile recharge. Similarly, all users which indicate the existing users have access to offers and discounts on payment of landline bills and other bill payment. The offers on HappySale are varied and offer something for everyone to browse and purchase. So go and get the one you like! When you select from the Freecharge coupon codes then you have a world of offers to select from! So when you are paying your bills online and also getting the recharges done you have the chance to get the best rebate. You have access to deals such as Rs.20 cashback on bill payment or recharge for Rs.20 for the new users. This is a good way to increase the customer base by providing attractive offers for new users. In addition to that you also have the chance to get a 10% cashback on both prepaid as well as post-paid recharges. The same applies for DTH and Data card recharge and bill payments as well. In addition to that, you have access to other promotional offers, site wide deals and other occasional deals that varies from time to time. So keep browsing and select the one you like best! If you are thinking that opting in for these offers is a tough job, then you need to know that it’s rather very easy! This means, all you have to do whilst browsing your offers and discounts, is opt in for the “show code” option. When you have this you get a code that you use when you are making the final bill and redeem your discount. All the offers and discounts offered by the brand have received a favourable feedback from the customers! If you get to save a total of Rs.50 on your landline bill payment, you will want to save more using these offers. Also most of the offers and discounts are always changing so that the customers have the chance to select from the latest deals that are authentic and verified and save more. From Rs.10 to Rs.100 and 100% cashback you have offers of all kinds that various customers can opt in for happily. If you want to make the most of the Freecharge promo codes, then you can keep browsing from HappySale as this is one of the best sites when it comes to online discounts and offers. You can go through the deal descriptions and then activate the offer you like best before the expiry date.